Zhang Gaoli (张高丽), currently the Party secretary of Tianjin municipality, and a former official in Shenzhen’s special economic zone. Suffragio‘s profiles of Xi and Li will come shortly, but in the meanwhile, you can read all about the five new members by clicking the links above. 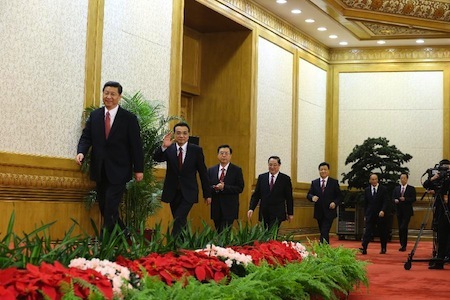 The Politburo Standing Committee has been reduced from nine members to just seven. Interestingly, the five new members (Xi and Li were already members) are relatively old — and so old that they will not be eligible for re-appointment in 2017 at the next National Congress because each will be older than the 67-year age limit for members of the committee. Both Zhang Gaoli and Zhang Dejiang, as well as Yu Zhengsheng are firmly protégés of former president Jiang Zemin (江泽民), who preceded current president Hu Jintao (胡锦涛), who is stepping down to make way for Xi. Left out are two key Hu allies: Li Yuanchao, currently director of the Party’s organization department, and Wang Yang, Party secretary in Guangdong province and perhaps the most notable advocate for political reform. 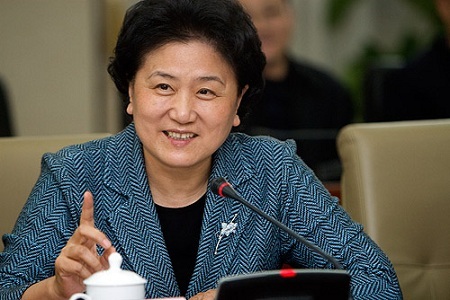 Liu Yandong, the only woman serving on the Politburo, also failed to make the cut. As has been predicted in recent days, Xi will become the general secretary of the Party and will also immediately assume the chairmanship of the CPC Central Military Commission. Xi is currently speaking to the press now, and his speaking style surely seems much more relaxed and expressive than Hu’s. The role of women in the CCP: just so much ‘beautiful scenery’? The 18th National Congress of the Chinese Communist Party (中国共产党) concluded today, but the photo above comes from a plucky photo essay at China People’s Daily, entitled ‘Beautiful Scenery,’ and depicts 14 photos of women delighting at various moments during the Congress. While 521 women serve as delegates in this party congress — 23 percent of the total, up from 18 percent a decade ago and higher than the 20 percent that women make up in the U.S. Senate — the members of China’s ceremonial electorate have far less influence over the process than their U.S. counterparts. The Party hasn’t historically been incredibly welcoming to women, and in its history, it has yet to elevate a single woman to the Politburo Standing Committee, the chief governing body of the Party (and, accordingly, the Chinese government). The members of the Politburo Standing Committee are likely to be announced by the end of this week. In advance of the 18th National Congress of the Chinese Communist Party (中国共产党), set to begin November 8, the South China Morning Post printed Friday what it believes will be the list of the seven members of the most elite body in Chinese policymaking: the Party’s Politburo Standing Committee. The list has been corroborated by other news sources, and while not final, seems very likely to be the seven set to be appointed at the Congress. The Standing Committee, expected to be reduced from nine to just seven members, is drawn from the larger (~25 members) Politburo, which itself is drawn from the ~300-member Central Committee of the Party. Xi Jinping (习近平), a member of the Standing Committee since 2007 and the current vice president of the People’s Republic of China, is widely expected to replace Hu Jintao as China’s ‘paramount leader,’ general secretary of the Party and, later in March 2013, as PRC president. 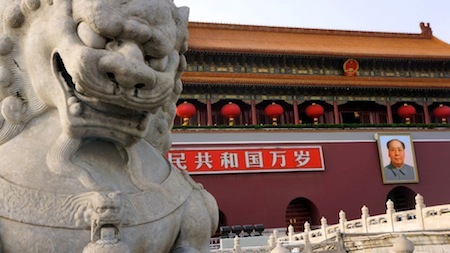 Xi is a ‘princeling,’ one of a group of current Chinese political leaders whose fathers were also senior Party leader during the first decades of Communist rule in China. His father, Xi Zhongxun, was purged during the Cultural Revolution of the 1960s. Xi previously served as the Party secretary of Zhejiang province (essentially, Shanghai’s hinterland on the south-central coast of eastern China) and then of Shanghai municipality in 2007 until becoming vice president. Li Keqiang (李克强), also a Standing Committee member since 2007 and the PRC’s executive vice premier, is widely expected to replace Wen Jiabao as China’s premier in March 2013. He served as Party secretary in Liaoning province from 2004 to 2007. He’s seen as a Hu protege, but will have a hard time following Wen, who remains perhaps the most charismatic and genuinely popular Party leader within the PRC today. Wang Qishan (王岐山), a vice premier for economic, energy and financial affairs and a Politburo member since 2007, is seen as one of the most capable up-and-coming Chinese leaders. Notably, he’s also seen as a proponent of further liberalization of China’s economy, additional fiscal reforms, and further foreign development and investment. He headed the China Construction Bank in the 1990s, took over as the Party chairman of Hainan province (the tropical island at the south of the Chinese mainland) from 2002 to 2003 and served as mayor of Beijing from 2003 to 2007 before his appointment as vice premier. Zhang Dejiang (张德江), a vice premier for energy, telecommunications, and transportation and a Politburo member since 2002, like Wang, is a protege of former PRC president Jiang Zemin, Hu’s predecessor, and like Xi, is also a ‘princeling.’ Zhang has a long career in Chinese politics — he was Party secretary of Jilin province (in China’s northeast, bordering North Korea and Russia) from 1995 to 1998 under Jiang, Party secretary of Zhejiang province from 1998 to 2002, Party secretary of Guangdong province (the largest province in China, and the home of Guangzhou and the Pearl River valley, where much of China’s amazing export growth has taken place in the past two decades) from 2002 to 2007, during the worst of the SARS crisis, and most recently, since March 2012, the Party secretary of Chongqing municipality following the removal of disgraced Chinese leader Bo Xilai. Yu Zhengsheng (俞正声), currently the Party secretary of Shanghai municipality and a Politburo member since 2002, is also a princeling, and was very close to former leader Deng Xiaoping as well as to Jiang. He was the PRC’s minister of construction from 1998 to 2001, Party chair of Hubei province in central China from 2002 to 2007, and thereupon became Party secretary of Shanghai. Liu Yunshan (刘云山), director of the Party’s propaganda department and a Politburo member since 2002, who will likely remain in charge of propaganda and censorship. Certainly no princeling, Liu rose up through the Party’s youth league. His elevation to the Standing Committee marks a victory for the more conservative elements of the Party. Zhang Gaoli (张高丽), currently the Party secretary of Tianjin municipality and a Politburo member since 2007, and yet another Jiang protege. Zhang rose to prominence as the Party secretary in Shenzhen from 1997 to 2002 — Shenzhen is the special economic zone adjacent to Hong Kong that emerged as one of the PRC’s few early free-market zones, and Zhang’s experiences there make it likely that he’ll be among the Standing Committee members most likely to support further economic reform. He thereupon became Party secretary of Shandong province, just south of Beijing on east-central coast of China, from 2002 to 2007, and was thereafter appointed to his current post in Tianjin.